KYIV, Ukraine—Over the past year, migrant caravans from Central America have become bigger and better organized, experts and officials say, underscoring a looming immigration crisis that will test U.S. immigration laws and strain the U.S.-Mexico relationship. On Jan. 29, John Rood, U.S. undersecretary of defense for policy, told Congress that three migrant caravans were crossing Mexico, headed for the U.S. border. One of those caravans comprised roughly 12,000 people, Rood said, reportedly the largest migrant caravan on record. These caravans mainly comprised migrants from the Central American countries of Honduras, Guatemala, and El Salvador, an area known as the Northern Triangle. Once they arrive at the U.S. border, many Central American migrants ask for asylum, claiming “credible fear” of being harmed should they return to their home country. In fiscal year 2018, U.S. Customs and Border Protection registered 92,959 asylum claims on the southern U.S. border, a 67 percent increase from the year prior, according to agency data. “These numbers reflect a dramatic increase in initial fear claims by those encountered on the border, which is straining border security, immigration enforcement and courts, and other federal resources,” U.S. Customs and Border Protection Commissioner Kevin McAleenan said in a press release published to the agency’s website. On their own, bigger caravans don’t account for that notable increase in asylum-seekers. Even this January’s 12,000-person caravan represents a fraction of the 50,753 people apprehended illegally crossing the southern U.S. border in December alone. Experts say the changing nature of caravans is symptomatic of a broader change in the nature of immigration across the southwestern border, as more women and children are now making the journey with hopes of using loopholes in the asylum process as a means to gain entry to the U.S.
“Nationals from the so-called Northern Triangle countries of El Salvador, Honduras, and Guatemala see their countrymen successfully make it to the U.S. border in caravans, which makes it more likely that they will join future caravans,” said Andrew Arthur, resident fellow in law and policy for the Center for Immigration Studies, a U.S. research institute. Arthur, who is a former federal immigration judge, told The Daily Signal that U.S. immigration laws incentivize migrants to make the hazardous overland journey across Mexico to the U.S. border. Arthur singled out the so-called catch-and-release policy, which allows asylum-seekers to live and work in the U.S. while awaiting a court decision on their immigration status—a process that can take up to two years. “The issue is not so much the caravan concept itself, as it is the loopholes that those members of the caravan seek to exploit,” Arthur said. There is a current backlog of more than 809,000 immigration cases in the U.S. court system, according to Department of Justice data published by the Transactional Records Access Clearinghouse, a research center at Syracuse University. That number is a sharp jump from fiscal year 2015, when the immigration court backlog was at 456,216 cases, according to Justice data. Migrant caravans are nothing new. Prior to last year, however, most caravans typically comprised less than 100 migrants, experts and Mexican officials say. Last November, about 12,000 migrants crossed Mexico spread out among five caravans—the largest of which numbered about 4,500 people—underscoring a notable shift in the status quo, which many experts warned at the time could be the bellwether for a long-term problem. “It’s never been like this, it’s an unprecedented volume,” said Gustavo Mohar, a former undersecretary for migration, population, and religious affairs in Mexico’s Interior Ministry, during a November interview in Mexico City. So far this year, it seems as if those worries are coming to fruition. In January a new wave of caravans entered Mexico from Central America, headed for the U.S. border. In the intervening weeks, those caravans have diminished in size, with many migrants opting to stay in Mexico. Currently, two caravans remain, reportedly totaling about 5,500 total migrants, Agence France-Presse reported Wednesday. Of that number, about 1,700 are in the first caravan, which is camped near the Mexican border city of Piedras Negras, while 3,800 are in a separate group farther south. Mexico recently canceled a fast-tracked visa program, which allowed Central American migrants to live and work in Mexico. Many experts saw the so-called humanitarian visa program as a way to dilute the size of U.S.-bound caravans, by offering migrants a chance to settle in Mexico. With the program’s cancellation, however, some worry that more migrants will arrive at the U.S. border. “This raises the specter of another humanitarian disaster,” Arthur wrote in a Feb. 1 Center for Immigration Studies report. During Tuesday’s State of the Union address, U.S. President Donald Trump said he would send an additional 3,700 troops to safeguard the southwest border from the approaching caravans. About 2,300 active-duty troops are currently deployed to the southwest border region, according to the Defense Department. So far this fiscal year, more families are arriving at the southern U.S. border, too, government data shows. U.S. Customs and Border Protection apprehended 27,518 migrants illegally crossing the border with their families in December—a new monthly record, the Department of Homeland Security reported in a Jan. 9 press release published on its website. “[Migrants] know that once in the United States, if they travel with children, they will be released,” Arthur said. Additionally, in December, U.S. officials apprehended 4,766 unaccompanied children illegally crossing the border. In fiscal year 2017, U.S. officials apprehended or turned back at ports of entry an average monthly total of 13,210 unaccompanied children and migrants traveling with families. So far in fiscal year 2019, the monthly average is 31,188—a 136 percent increase, the Department of Homeland Security reports. Economic woes and endemic violence spur many Central Americans to embark on the long overland journey to the U.S. border. The increase in families trying to cross the border has had troubling consequences. Due to long delays at official ports of entry, some families opt to cross the southwest border illegally—risking their children’s safety in the process. 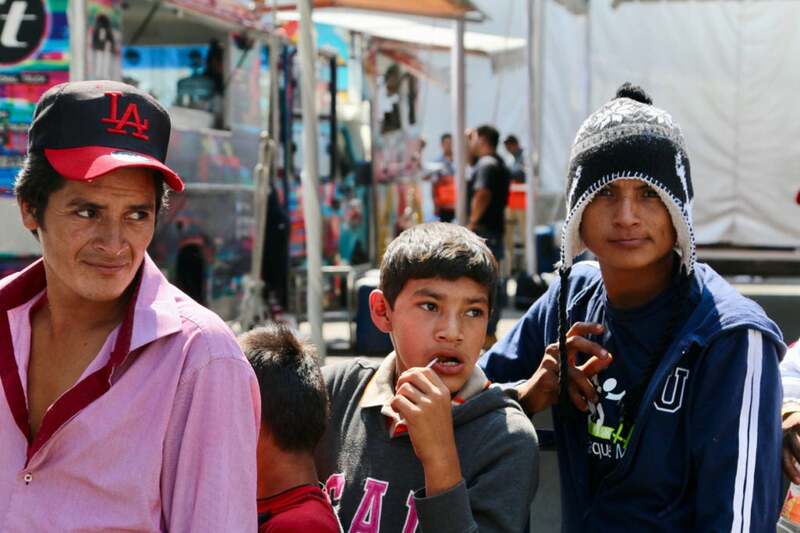 On their journey across Mexico to the U.S., the caravans are fed and supported in myriad ways—including medical care, clothing, shelter, and security—by both the Mexican government and civil society. They’re also aided by outside groups such as the Chicago-based nonprofit People Without Borders, as The Daily Signal witnessed in November at a migrant caravan encampment in Mexico City. International aid groups like Oxfam, the Red Cross, and the U.N. Refugee Agency also help. 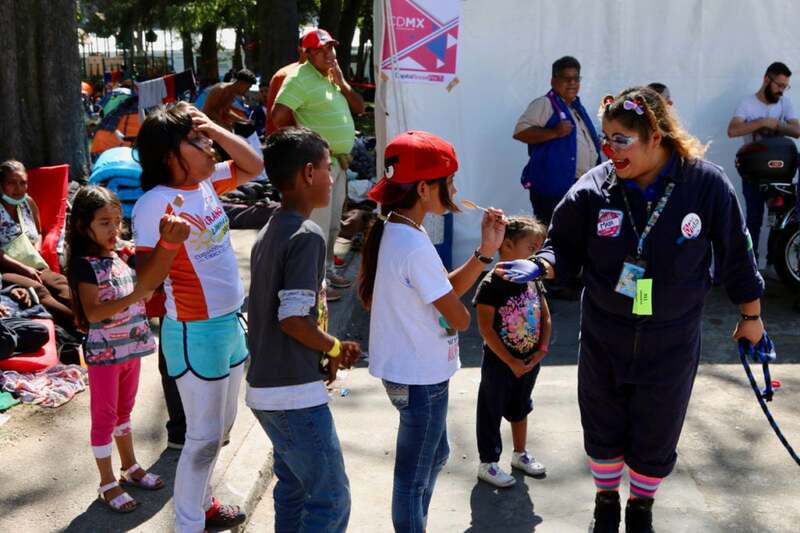 But the Mexican government provided the lion’s share of support services for November’s caravans, tapping into emergency resources stockpiled for a major disaster like an earthquake or a hurricane. The robust support network the migrant caravans enjoy has sparked some backlash in Mexico—a country plagued with its own economic and security woes. And now that bigger caravans have become a recurring fact of life, there are signs that Mexicans’ patience is straining. According to Mexican news reports, the reception of this January’s caravans by Mexican townships was markedly cooler than in November, highlighting what some experts say is a broader shift in Mexican opinion against Central American migrants. A November poll by the Mexican newspaper El Universal showed that 73.1 percent of Mexicans have an unfavorable opinion of the migrant caravans. Of that number, 46 percent worried that crime would increase, while 27.1 percent were concerned the migrants would take jobs from Mexicans. Central America migration to the U.S. is driven by a combination of what experts call “push” and “pull” factors. 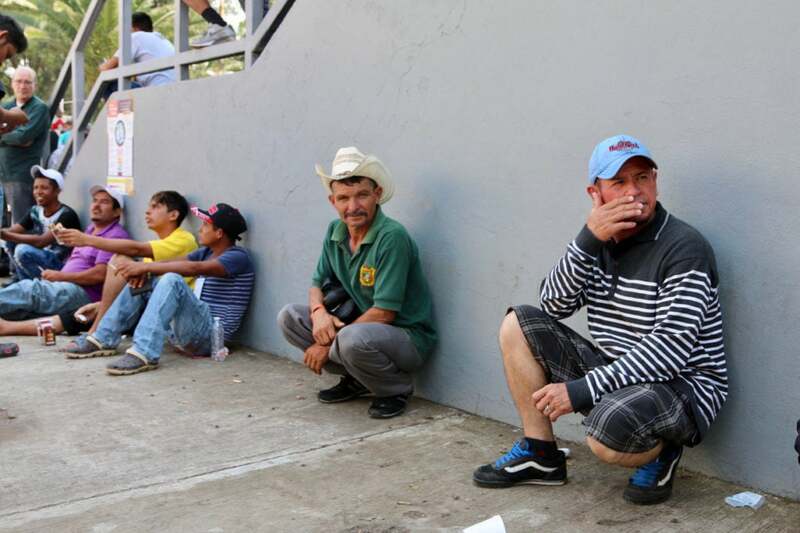 Push factors include bad economies and endemic violence throughout Central America. Pull factors, on the other hand, include the strong U.S. economy, along with anecdotal stories of migrants successfully entering the U.S. illegally or through the asylum process. Migrant caravans have become bigger, better organized, and more frequent, experts say. For his part, Arthur, the former federal immigration judge, echoed Inserra’s line of thinking. Previously, the dangers of kidnapping, robbery, and sexual violence had deterred many migrants from making the overland journey from their homelands across Mexico to the U.S. But the new era of bigger, better organized caravans has changed that calculus. Now, many migrants are willing to take their chances at the U.S. border if they feel like they can safely cross Mexico within the ranks of a caravan. Moreover, joining up with a caravan is cheaper than paying human traffickers—colloquially known as “coyotes”—about $7,000 for the journey north to the U.S.
Another new dynamic is the frequency with which Central American activists have exploited the creation of caravans for political gain. Yet, the sheer number of Central Americans willing to drop their lives on moment’s notice and join a U.S.-bound caravan has caught even these political opportunists off guard. “Rather than the occasional protest … these caravans have taken off in ways that organizers probably never thought they would, and are now a regular occurrence,” Inserra said.